Running events will inevitably leave you open to some risk – as in any job that involves people and their wellbeing or safety. For this reason it’s very important to ensure you have adequate insurance for example, but also that your event is covered in terms of your agreement and contract with the client. Apart from the fact that things can go wrong on the day, and the very nature of events means that this is very often the case! There is also the possibility that things might go wrong beforehand. Clients who have given a verbal agreement for a booking or an aspect of the event may then renege, or pull out completely, and if you’re not covered for this eventuality you can find yourself in a tricky situation. In order to make sure you are secured against any responsibility for things that are beyond your control it’s vital to have clear terms and conditions attached to your contract. 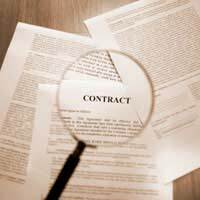 Your contract should always be accompanied by your standard terms and conditions. These are the ‘rules’ your company has set out that your clients must agree to – and that you commit to operate by. When drawing up both contracts or terms and conditions it’s vital you seek proper legal advice, and every company’s terms will be different, but as a starting point, there are certain areas you need to consider. When do you expect payment and in what format? Is some of that a deposit, and if so, when is the remainder due? Attached with the terms should be the contract which clearly outlines the details of the services that you are committing to. Important this one. This outlines what happens in the eventuality of cancellation by the client and what liabilities they are then subject to. What happens if you have a signed contract and the client wants to add or change aspects of the job? It’s important to be flexible of course but you still need to outline what effect that might have, and how and when it will be paid for. In the terms you will have stated when payment is due. If the client is late paying this, you will need some recourse to resolve this. How long before you start adding interest for example, or what steps will be taken to recover the outstanding balance. Running events necessarily means you are dealing with people. People are unpredictable, particularly when alcohol is involved. A clause in your terms covering your right to handle any difficult situation as you see fit is often a good idea. It will give you the right, for example, to eject aggressive guests from a party, and if your requests are not met, you could even have a proviso that the event is brought to a stop. Ensure your authority clearly – after all if it goes wrong, it’s your event and your name on it. Loss or damage to personal effects, the venue, equipment etc. should all be covered in your terms. This clause should cover you for death or injury to your guests and clients. These are the main areas you should consider covering but your legal counsel may have other clauses and terms that he or she considers important, depending on the nature of your business. But make sure your client signs both these, and a copy of the contract.